As round two of the BNT V8s gets underway this weekend at Pukekohe, championship leader Nick Ross says he’s ready to keep pushing and to hopefully extend his points lead. Nick Ross holds a narrow points lead in the BNT V8s Championship. “I’ve never come out of the season opener leading the championship before. So, the approach is to get out there and win more races,” said Ross. Ross currently enjoys a narrow eight point lead over Jack Smith from Australia, with Hamilton’s Lance Hughes a further 29 points back in third. Ross says he is mindful of the quick young Australian who showed impressive speed at Pukekohe in November. Looking to bounce back this weekend will be the three-car Richards Team Motorsport outfit who had a subpar weekend at the opening round. 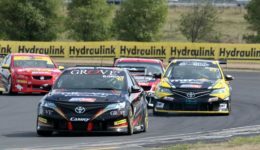 Two of their Toyota Camry’s belonging to Chelsea Herbert and Brenton Grove both suffered similar throttle body issues, while the third car of Scott Taylor was caught up in an accident in the final race of the weekend. All three cars have been repaired, and in particular the team is confident that the throttle body issues have been rectified. Looking to bounce back and making his way further up the grid will be Brad Lathrope. 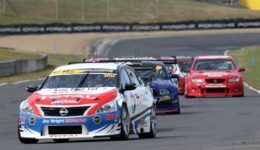 The Auckland driver had a disappointing weekend at Pukekohe in November, making light contact with the tyre wall at turn four, causing enough damage that he did not make the start of race three of the weekend. Rob Wallace aboard the ex Greg Murphy SuperTourer had a lucky escape at Pukekohe in November, making light contact with the wall at turn two. Clean races for the rest of the weekend sees him hold down fourth spot in the championship. 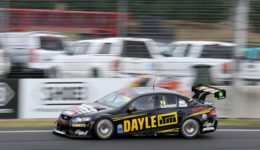 Matt Tubbs will line up in his Jumpflex Holden Commodore having finished up sixth overall at Pukekohe last month. Expect a tight battle in Class Two between Taranaki’s Matt Podjursky in his Ford Falcon, against Justin Ashwell also in a Ford Falcon. Looking to get in front of the two Fords will be the Holden Commodore of Matthew Clarke. Class Three sees the Holden Commodore of Blair MacDonald go against the Holden of Tony Anderson; with Nigel Karl competing in his repaired Ford Falcon following its fire at Pukekohe last month.